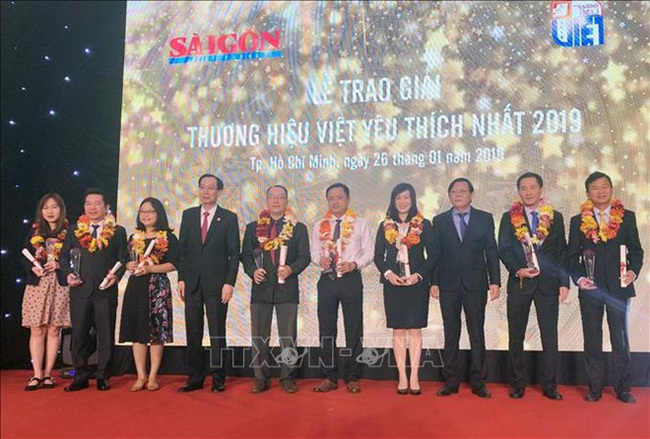 VTV.vn - The Sai Gon Giai Phong (Liberated Sai Gon) newspaper hosted a ceremony in Ho Chi Minh City on January 26 to honour 27 most popular Vietnamese brand names in 2019 selected by its readers. The awarded firms operate in various fields – services, tourism, trading, and real estate, including food producers Vissan, Nutifood, and Vinh Thanh Dat, supermarkets Co.opmart and Big C, tour operators Saigontourist and Ben Thanh tourist, and Vietnam Airlines. Meanwhile, 18 brand names that have won the award for many consecutive years received the “Golden Brand Name” prize. Le Thanh Liem, deputy chairman of the HCM City People’s Committee, said the local authorities always value the enterprises’ role in contribution to the city’s growth. Organised since 2006 in response to the “Vietnamese people prioritise Vietnamese goods” campaign, the annual event aims to encourage businesses to build prestigious, high-quality Vietnamese brand names and to build a consumption culture among Vietnamese people.